By quality we generally mean. Standard of a product, when compared with other brands of the same product; and how good or bad something is. And, when we want to classify it, we call it poor, good or even excellent. Quality, to my mind is also deliverance of what you promise. For, quality is something that keeps evolving, and anything that evolves cannot become an ‘excellence’ overnight. 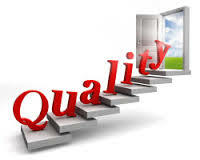 So quality varies along the process of evolution of a product or service. Sporadic quality here and there has little meaning, unless it comes along with consistency. As that once-in-a-while approach to quality, appears as an insouciance dabble by any producer or marketer. Recently, when I was in my hometown. I visited ‘King of chaat’ (a street food joint) a couple of times in Hazratganj—an up market of Lucknow, that I used to visit some thirty years back. Since, then, this food joint has gone through a generation and has even grown exponentially. But that apart. I was more astonished at the very fact, that each dish tasted just the same as it used to taste some thirty years back. And, in all probabilities many of their employees also by now, must have changed hands. But the food joint has been able to maintain its foot fall only through its dictum of quality with consistency, I’m sure. And this is not an example in isolation. As in every city you will find similar street food joints that must have commenced with tasty quality. But those that have survived, and saw growth had the element of consistency in them and the rest packed off. That brings me to the moot point. That each business professional should also be like a street food joint that needs to consistently give quality output to grow in life. I am particularly comparing such professionals with street food joints, because they operate under the most difficult circumstances and are not as resourceful as big enterprises. And, apart from internal pressures they also take on fierce extraneous pressures to which they are often vulnerable. A nice one !! Gives us food for thought for the day !